Mickey’s Kyle McLaughlin (l) greets Black Dog’s Mike Whiteside. When you want to carefully extract architectural elements from a home or historical property, or disassemble an old, crumbling building, who you gonna call? Black Dog Salvage, the Roanoke, VA-based leader in the residential and commercial reclamation field and host of Salvage Dawgs, of one of the most popular Reality TV shows on the airwaves today. When Black Dog Salvage wants to help its crew work more safely and productively at the reclamation site, who they gonna call? Mickey Truck Bodies, the nation’s leading truck body and trailer reconditioning company with 4 freestanding facilities across the country. 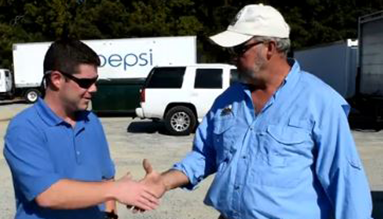 Salvage Dawgs will begin its 5th season in early 2016 on DIY. Every show is a fast-paced and fun treasure hunt with the mission to “reclaim, renew and redefine architectural salvage for a sustainable future.” Click HERE for the Salvage Dawgs Episode Guide on the Black Dog web site for seasons 1 – 4. The DIY Network also has a handful of episodes available streaming on their website; Hulu has Season 1 available; and both Amazon & iTunes have all 4 seasons available to purchase.